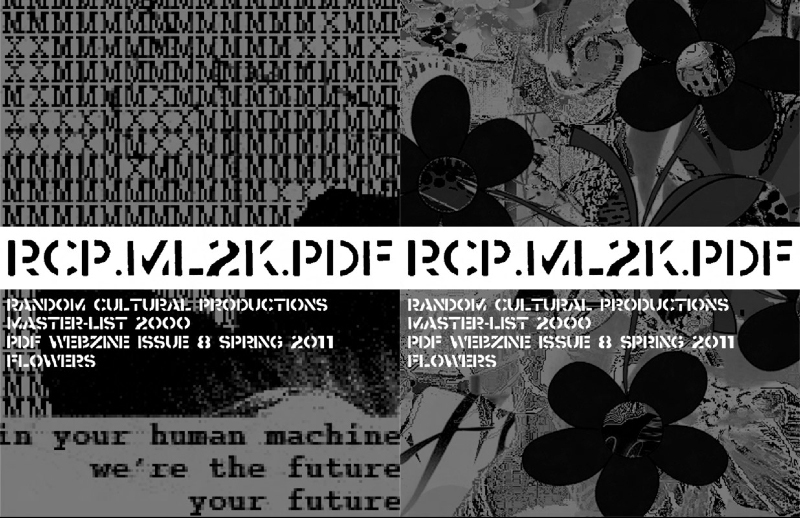 RCP.ML2K.PDF Issue #8 “Flowers” is now out! RCP.ML2K.PDF is a PDF webzine available for download online, and is a collaboration between A. Bill Miller and myself. The project explores image circulation, as well as the fluid and adaptable nature of images in the digital environment. The project was developed with the intent to create an artwork that participates in the gift economy of file sharing. This is our eighth issue and we’ve been going strong for about two years now with regular quarterly issues. RCP.ML2K.PDF will be included in an exhibition in Germany this summer! I will post more information about the exhibition soon! To download Issue #8 click here -or- visit the RCP.ML2K.PDF site. Pingback: пдф фото | Свежие фото!